Trying to create vibrant, active public spaces? Seeking new tools for more effective community engagement? Looking for ways to gather better evidence so you can plan with greater certainty? Trying to deliver more with less? Tactical Urbanism can help. This internationally proven approach to neighbourhood building can help you transform places and build stronger communities through low-cost, short-term improvements to streets and public spaces. What topics will the forum cover? We will challenge everyday thinking about the way we create places, spaces, and neighbourhoods through:•Low-cost strategies for bringing underused local spaces to life. Engaging local communities and building support for projects. Evaluating projects, so you can plan with greater certainty. Tactical urbanism for local government - how to manage risk and expectations. Rapid community building strategies for urban infill and greenfield developments. Be inspired by global case studies and international experts in tactical urbanism. Learn practical tools to implement fast changes in your local area through a practical exercise. Hear from local and global experts on how to make things happen, navigating risk and permits. Gain useful insights on how a tactical approach might help generate creative solutions for your problem space. Networking opportunities with like minded practitioners. 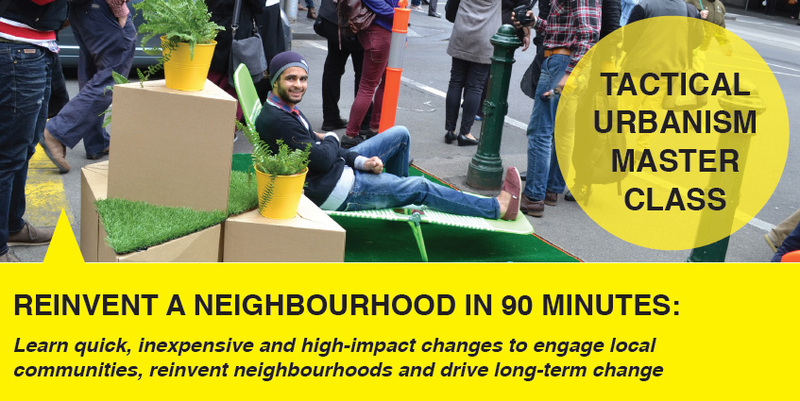 Sydney: June 18, featuring Mike Lydon author ot Tactical Urbanism. Register here. Melbourne: June 24, featuring Stephen Yarwood former Lord Mayor of the City of Adelaide. Register here.